President Obama will visit China in this coming fall. IBD《國際商報》will publish a special edition related to Obama's visit. If you are interested, please either contact ChineseCEO or IBD directly. IBD《國際商報》 is directly under the leadership of Chinese Ministry of Commerce. They have sent a delegation to visit CHINESECEO last year and have established a good relationship each other. On behalf of the Ministry of Commerce of P.R.C. 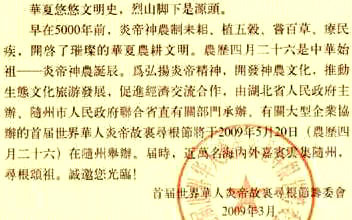 (MOFCOM) and the Chinese Consulate General in Los Angeles, we sincerely invite you to attend the event "OPEN LEADS TO LIGHT, TRADE BRINGS US GOLD" as our dignitary guest in LAS VEGAS on Aug. 10th , 2009. Under the current situation of worse-than-expected world economy, governments of all the main countries have taken various countermeasures. China is one of them. We open our market and encourage global trade by our action. For this event, we are going to provide a great opportunity not only for the buyers who want to source from China's manufactures but also for the sellers who are willing to know how to explore China's rising consume market. We are looking forward to meet you in Las Vegas on Aug. 10th. It will be highly appreciated if you could reply by Aug. 5th. And we also cordially welcome your member companies to join us together, please feel free to transfer the flyer below.Thanks! CIFIT delegation from Xiamen, Fujian will visit LA and held a press conference at Chinese Council General building (443 Shatto Place, L.A. Ca.) on 7/15 (Wednesday). It starts at 10:00am. The purpose of their visit is to promote CIFIT Xiamen Event . Our President Richard Lee and our CEO Delegation have met them in Beijing last year. Jay and his Etech will also form a world capital forum in Xiamen in Sept this year. All members of Chinese CEO are welcome to attend. If you are available and want to meet CIFIT guests, please come on 7/15. "相聚長三角" 活動是由上海、江蘇、浙江三省市僑辦聯合舉辦的僑務品牌專題活動。活動定于2009年5月17∼22日舉行，在 "國務院僑辦引智引資重點聯系單位" ──張江高科技園區設主會場，江蘇、浙江設分會場。海外嘉賓在參加上海主會場活動后，可自愿選擇參加江蘇或者浙江分會場活動。詳細內容及申請表, 下載文件. This conference will focus on the Great Change Challenges & Opportunities post 2008 Financial Tsunami. And The Conference Luncheon will be keynoted by Honorable Fredrick Fu Chien, Chairman of 09 Taiwan Delegation to BoAo Asia Forum, former President of ROC Control Yuan, Chairman of ROC National Assembly and former ROC Minister of Foreign Affairs. Zappos.com, renovating shopping behavior worldwide, will be the recipient of the Annual Entrepreneurial Award, of which previously recipients, amongst others, included Philip Chen of Apex Computer System, Richard Lee of Amsino Medical Group and Ming Hsieh of Cogent System (Nasdaq: COGT). Business and financial leaders are also invited to speak on the morning panel before the Luncheon. Invitation:A Dinner Banquet for Chinese Intellectual Property Delegation Join us for this rare opportunity to meet this important Delegation and learn about the latest development in China's IP policy and Strategy. Cost: $100 per guest。Spaces for this event are limited. Leading by the executive vice mayor of Harbin city, China is coming to visit Los Angeles. Chinese CEO will host a welcome dinner for the delegation on Tuesday, March 10th at San Gabriel Hilton. If any memeber of Chinese CEO would like to attend this event, please contact Ms. Diana Jiang Kaplan, VP of Chinese CEO Organization. Venue: San Gabriel Hilton Hotel - San Diego room. 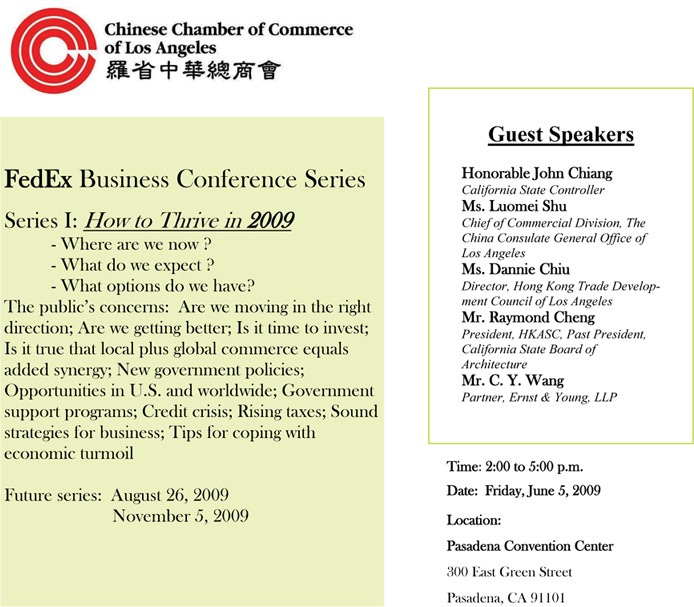 The coming Greater China Business Conference will be held at UCLA on Feb 27 . If you are interested in the conference, please contact Mr. Genping Liu. In celebrating Chinese New Year of 2009! The year of OX. All members are invited. Reservation is required. Please be on time, dinner will be started promptly at time. Cost for this event is $20 per person. Should you have any questions﹐ please contact Diana Jiang Kaplan at 626 - 589 - 5522. US-China Enterprises Forum has been very successful on 1/20/2009 (Tuesday) at Pacific Palms Conference Resort. ChineseCEO is the key organizer. US-China Enterprises Forum is on 1/20 (Tuesday) at Pacific Palms Conference Resort. It is open to our members. As business platform, the Forum will be a great place for us to update and exchange our business info. Any member likes to join, please contact Lu Cheng. Any member likes to join the dinner party on 1/19 (Monday), please contact Lu Cheng ASAP.